The staff of Catawba Regional Council of Governments are able to provide assistance with a wide variety of activities normally undertaken by local governments. These activities may include diverse areas such as grant writing, planning services, drone photography and videography, and Geographic Information System mapping and analysis. Catawba Regional has a long history of providing quality planning services within the region. Council of Government staff have been an integral part in cooperatively developing and revising Comprehensive Plans, Zoning Regulations, Capital Improvement Plans, and general Land Use Planning. Our staff also has extensive expertise in a wide variety of state and federal grant opportunities that are available to local communities. The cooperative efforts of Catawba Regional and local governments and our long standing relationships with state and federal agencies has resulted in the successful securing of millions of dollars in grant monies for the region. Catawba Regional houses a state of the art Geographic Information System (GIS), combined with staff totaling more than 25 years of cumulative experience. 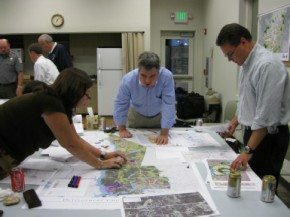 Catawba’s GIS services range from simple map making to extensive spatial analysis and roving local GIS administration.